A representative of the Philippine Association of Colleges and Universities (PACU) as a member. Pursuant to E.O. No. 156, series of 1968, as amended, PEAC is allowed to hire administrative staff to assist it in running its programs and activities. In this regard, it has created the PEAC National Secretariat (PEAC NS) that is headed by PEAC’s Secretary who also acts as Executive Director appointed by PEAC for a fixed term. Under E.O. No. 150, series of 1994, amending Section 2 of E.O. No. 156, series of 1968, PEAC was granted the express authority to manage and administer contributions, donations, grants, bequests, gifts and/or loans from the Government of the Republic of the Philippines for programs of assistance to private education. In 1982, the DepEd, through the assistance of PEAC, successfully piloted a scheme which served as a precursor to the Education Service Contracting (ESC) and provided a cost-effective alternative to public school expansion by entering into service contracts with private schools that would accommodate overflow students from the public schools as well as students in communities where there were no public schools, thus enabling the Government to realize substantial savings. In recognition of the favorable outcome of and feedback on the ESC program during its pilot phase for the period 1982-1986 and its national implementation handled by PEAC from 1986-1991, DepEd since 1996 up to the present has engaged PEAC as co-implementer to assist it in the management and implementation of the ESC, Teachers’ Salary Subsidy (TSS), Senior High School Voucher Program (SHS VP), as well as In-Service Training (INSET) of the Government Assistance to Students and Teachers in Private Education (GASTPE) program established under R.A. No. 6728, as amended by R.A. No. 8545 for private school programs. 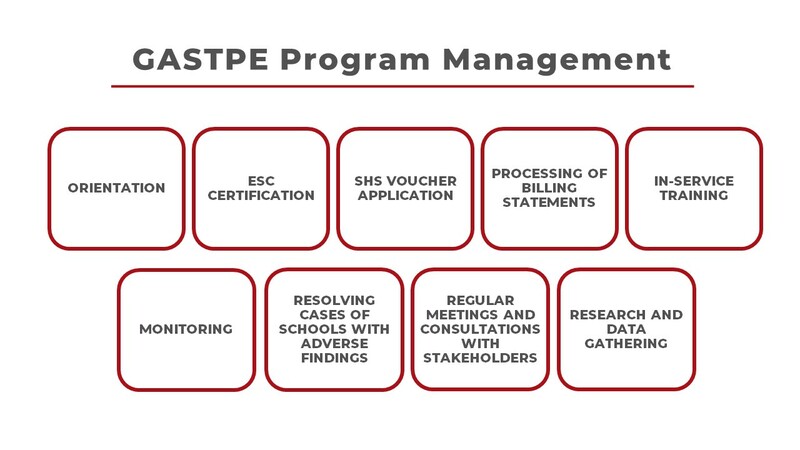 PEAC has the necessary wealth of experience and proven track record of efficiency and competence in rendering assistance to the DepEd in the implementation of the ESC, TSS, and INSET of the GASTPE program. Furthermore, PEAC has established it Regional Secretariat (PEAC RS) in 16 regions, composed of Regional Program Directors and Regional Program Coordinators. The PEAC Regional Program Directors (RPDs), who are heads of leading private educational institutions and private educational associations in the region, are appointed by the PEAC and in turn the RPDs designate their respective Regional Program Coordinators.